There have been numerous studies over the last century showing impressive results with both magnesium sulfate (commonly called Epsom salts) and magnesium chloride to alleviate magnesium deficiency symptoms. Elements in Sea Water: There are about 90 elements found in sea water. Each litre contains about 35 g of dissolved salts (3.5%), of which sodium and chlorine make up more than 90%. Together with magnesium, sulphur and calcium, these dissolved salts represent a total of 99%. Add only three more elements – potassium, bromine and carbon – and you have more than 999 parts in a 1000 of the dissolved mass in seawater. 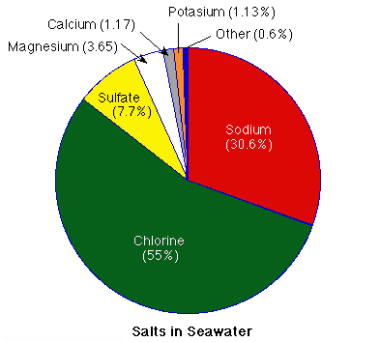 Magnesium chloride and magnesium sulfate compounds are the most common forms of magnesium found in sea water. Individually, sulfate represents about 7.7%, magnesium approx 3.65% and chlorine 55%. 70% of the body’s electrolytes are chloride ions. Interestingly, magnesium chloride is more readily taken up by the body, as chloride forms over 70% of its negative ion content. In other words, the body is very hungry for chloride – in particular magnesium chloride, compared to magnesium sulfate. What are the Differences in What you can Buy? When you purchase magnesium sulfate from the supermarket however, it is usually not one harvested from ocean water, but manufactured in a factory as an isolate which is magnesium sulfate. It does not contain the other sea trace minerals that would be present in dehydrated sea salt. Magnesium sulfate is very cheap and in the event you can’t get hold of anything else, it can certainly save your life. When you purchase magnesium chloride on the other hand, it is usually harvested from sea water sources that are dehydrated from open ocean, alpine salt pockets, dessert salt pans and lakes, or desalination plants. This salt also has about 2% of other trace minerals still wrapped up in the complex. The majority (about 85%) of magnesium chloride flakes in the world are industrial grade, which be used for making magnesium metal alloys, fireworks, or for road de-icing, air cleaning at mining operations, used as soil fertilizer or in aquaculture systems, salt swimming pool chlorination or as bath salts. Food grade magnesium chloride flakes are mostly used for making tofu by Asian food manufacturers, for mineralising filtered drinking water or for use as a horse feed supplement. Pharmaceutical grade magnesium chloride is also made by further processing of the food grade flakes. The best magnesium chloride source waters for food grade salts are deep ocean or pristine alpine regions not near industry, mining, agriculture or large populations. We need sulfate, but in smaller amounts. Magnesium sulfate is rapidly excreted through the kidneys so that the sulfate doesn’t hang around more than we need it too. This means the magnesium component goes out with it often before enough can be used. DETOXIFICATION: Sulfate has its benefits because it is an important influence over almost every cellular function. It attaches to phenols and makes them less harmful, and sets them up for being excreted from the kidneys. Sulfate is also used in the blood transport system to carry nutrients in a non-activated state so they don’t coagulate. In this way it helps to keep the blood more fluid, which helps the cardiovascular system and micro-capillary access. People on the autistic spectrum have compromised detox sulfation pathways (methylation), which means they easily accumulate chemicals and waste products, becoming eventually chemically sensitive and prone to inflammation and ‘clogged tubes’. It means they can do with a bit more sulfate than the average person. This condition also always coincides with low magnesium status and higher sensitivity to stress. The best way to calm down a stress or anxiety attack is with a good magnesium salt soak, big magnesium water drink, and/or magnesium rub with magnesium cream, lotion or oil. Eating organic sulfur-containing foods such as garlic, onions, sesame seeds, eggs, fermented foods and bone broths (meat soups) allows the body to convert natural sulfur to sulfate as is needed, and thereby not over-supply the sulfate component. These foods also tend to be high in the other most important mineral and great co-factor with magnesium – zinc. WARNING: You can use magnesium sulfate to cause a bowel purge in the case of constipation, but pregnant women should be careful using this strategy because a huge diarrhea event can also trigger a spontaneous abortion. A magnesium sulfate bath can be a better alternative to taking it orally, as well as being very relaxing. Bathing in it however can feel harsher on skin compared to magnesium chloride bathing because of a dehydrating effect. Industry uses magnesium sulfate to tan hides! Sulfate is a skin barrier disruptor like alcohol or detergent. This means that over time and regular bathing the sulfate will deplete protective skin barrier oils, causing a skin drying effect. Beware also of sulfates in toiletries (like sodium laurel sulfate). Magnesium chloride hexahydrate on the other hand is hydrating and leaves the skin feeling soft and smooth. Regular magnesium chloride footsoaks prevent build-up of hard dry dead skin layers on heels, which eliminates the need to exfoliate or shave skin off. ‘Hexahydrate’ means the magnesium chloride is complexed with 6 water molecules in a crystal matrix which attracts water molecules. The flakes are hydrophilic and draw moisture from the air. If left open to the atmosphere long enough the extra water molecules from the air will liquefy the crystals until they become ‘magnesium oil’ (ie. magnesium chloride in water solution). 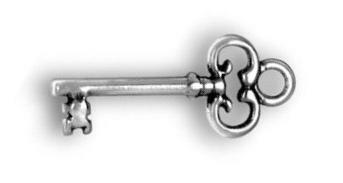 In the right dilution this electrolyte water has the right charge for cell uptake – like a key in a lock. 70% of the body’s electrolytes are chloride ions. In order to gain access to the intracellular spaces we need potassium and magnesium to be complexed as a chloride to ‘ionise’ them and become completely water soluble. The inside of cells are made up of a cytoplasm of structured water and that structure depends largely on the presence of enough magnesium. As the body is exceptionally hungry for the chloride ion as well as the magnesium ion, it will readily take up magnesium chloride in solution. 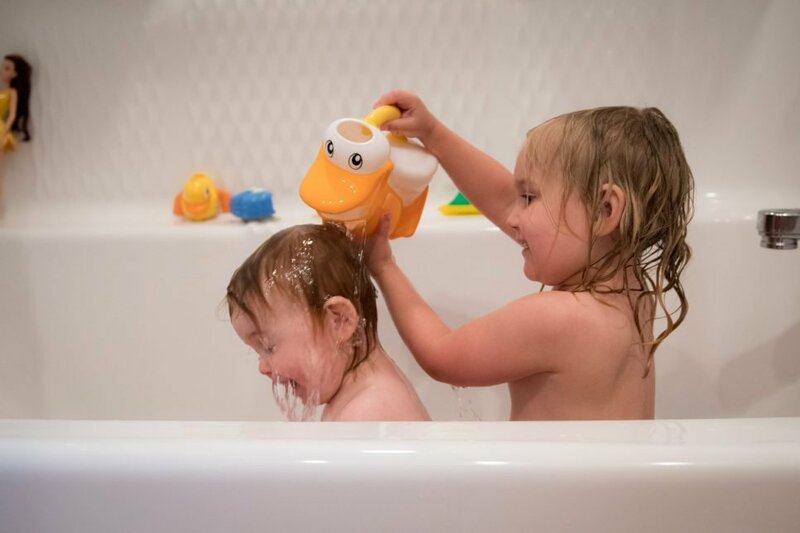 Magnesium chloride hexahydrate comes packaged with other sea trace minerals a-la-Nature and also gives you more bang for your buck, as only less than half the volume of magnesium chloride flakes is required in a bath compared to magnesium sulfate for a similar relaxation effect. Magnesium tablet and powder supplements are comprised of different complexes of magnesium such as magnesium oxide, magnesium citrate and various chelated magnesiums (ie. joined to amino acids), which have varying rates of bio-availability. At the lowest end is magnesium oxide with only 4% bio-availability. The better ones still only hover around 50% bio-availability. This means that half or more of what you consume is lost in the toilet. Tablets and powders also contain fillers and binders which can sometimes interfere with magnesium uptake. They are more difficult to digest in the stomach, particularly if stomach acid is low. Access across the gut wall, being very sensitive, is also restricted to low concentrations of magnesium such as what would be in mineral water or foods. Higher concentrations result in diarrhea, which means the magnesium is lost too quickly, despite how desperate your tissue cells may be to get more magnesium. 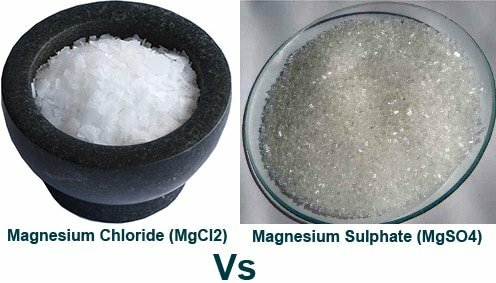 All the different forms of oral magnesium must first be digested and separated so that the magnesium can be complexed as a chloride for intracellular use. Digestion takes several hours. Magnesium chloride hexahydrate however, once in solution, is already in the right form for cells to take up quickly without requiring further digestion. Transdermal magnesium products have more success getting access to the interior of the body via the epidermis, which can cope with higher salt levels than the gut wall. Magnesium Cream, Lotion and Oil can also be used for muscle relaxation, skin care and as a transdermal magnesium supplement with faster results than oral supplements. The plant oils and butters in Magnesium Cream and Magnesium Charge Lotion assist the epidermal absorption of magnesium chloride, especially in the case of dry skin. The better condition of the skin the more optimal the magnesium uptake into the epidermis. The epidermis acts as a reservoir for nutrients (ie. electrolytes and essential fatty acids), making them available for absorption by the capillaries of the dermis layer underneath. 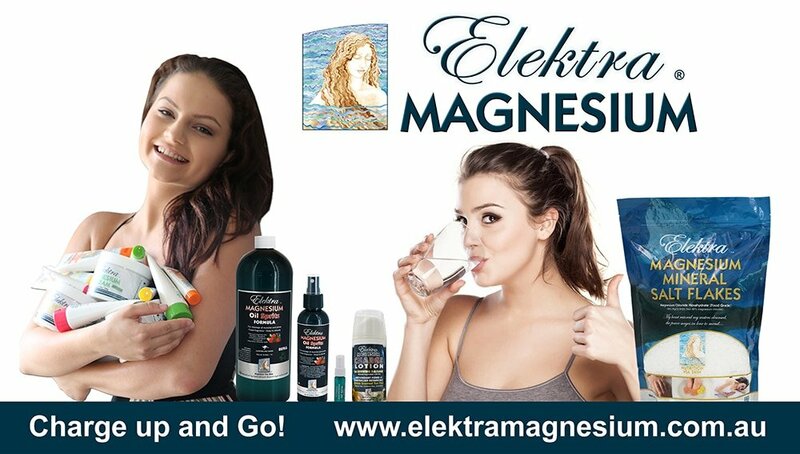 We are not only a walking water bladder (being mostly made up of water), but we are also made of the salts (electrolytes) of the earth – of particular importance being the master of minerals MAGNESIUM. Health decline, stress, pain and inflammation are always accompanied by a deficiency in magnesium and water. Why not replenish with Nature’s most fundamental, essential and powerful nutrition – magnesium chloride and water?